Are Live Focus selfies coming to the Galaxy S10 range? Samsung's Galaxy Unpacked announcement is now less than a month away. 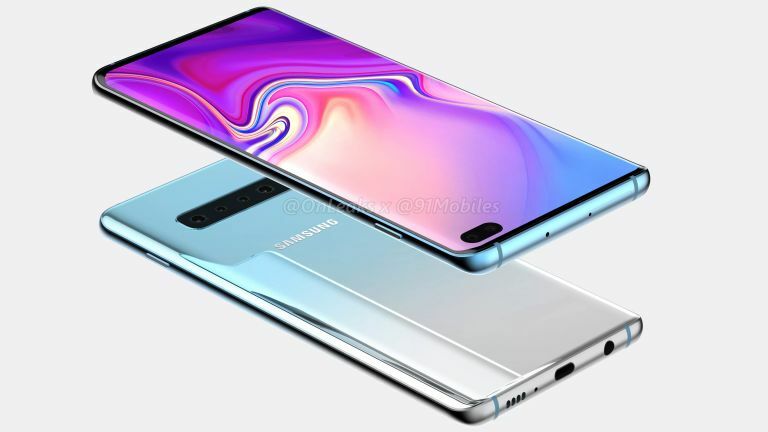 The feverishly-anticipated event is tipped to see the launch of the Samsung Galaxy S10 range, as well as the all-new folding, eye-wateringly expensive Galaxy X. Ahead of the announcement, a photograph purporting to show the Galaxy S10 Plus handset has surfaced online. The handset is the successor to the Galaxy S9 Plus, which launched worldwide in March 2018. The latest leaked photo tallies with the steady stream of rumours that have been trickling out from Samsung's supply chain, including the new all-screen design that pushes the AMOLED display to the very edge of the chassis. In order to maximise the amount of screen while keeping the physical footprint of the handset small enough to still be usable one-handed, Samsung has rehoused the front-facing camera to a small pinhole in the display. The proximity and ambient sensors and speakers are moved to the border, or buried beneath the glass display. Unlike the other two handsets in the Galaxy S10 line-up, the S10 Plus is widely-tipped to sport a dual front-facing camera. And that's exactly what you can see in the latest leaked shot of the forthcoming flagship phone. The latest Galaxy S10 Plus photo was posted by renowned Samsung insider Ice Universe, though the prolific tipster does not appear to be the one who took the original image. Unfortunately, there's no credit for the original source, so we have no idea where this shot appeared from. That said, Ice Universe has a pretty solid track record when it comes to Samsung leaks, so it's safe to assume this is the real deal. Samsung uses the dual-camera set-up on the back of its Galaxy S9 Plus and Galaxy Note 9 to add an adjustable, artificial bokeh-style blur behind the subject of the photographs. Dubbed Live Focus, this effect could be brought to selfies thanks to the addition of the secondary front-facing camera with the Galaxy S10 Plus. Samsung has already added this capability to its Galaxy A8 smartphone, which also sports two front-facing cameras. However, it's possible Samsung has something different planned this time around. It may have decided to take a leaf from the Google Pixel playbook and use the dual front-facing camera to take ultra-wide selfies. The Google Pixel 3 added the ability to zoom-out when taking a photo with the selfie camera to fit larger groups into the frame without the need for a selfie stick. The additional functionality provided by the dual front-facing camera has not been leaked ahead of Galaxy Unpacked, so we might have to wait for the keynote before we know the thinking behind the decision.